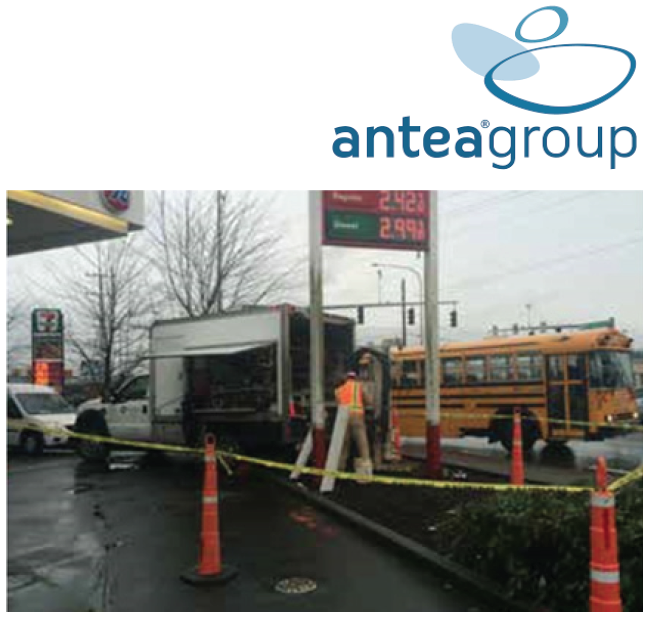 An active gas station in Bothell, Washington was listed as a LUST site by the State of Washington Department of Ecology after two subsurface investigations detected petroleum hydrocarbon (PHC) impacted soil and groundwater. Entering into the state’s Voluntary Cleanup Program (VCP) in 2001, the site continuously failed to meet regulatory requirements defined in the MTCA, despite several years of cleanup efforts using a soil vapor extraction (SVE) system and an air sparge (AS) system to remove contaminant concentrations from beneath the site. Charged with remediation, Antea® Group partnered with REGENESIS to implement a solution, which included in situ injection applications of PlumeStop and ORC Advanced technologies. REGENESIS injected approximately 200 gallons of PlumeStop using strategically placed point locations to rapidly reduce contaminant concentrations. Direct Push Technology (DPT) was employed to advance injection points throughout the treatment zone. The following day, the solution was increased, for a total of 835 gallons of PlumeStop solution (as applied with water) injected within the targeted treatment interval to deliver the full volume of remediation ammendment and complete the application on schedule. A total of nine (9) PlumeStop DPT injection points were cleared to 5 ft. bgs pre-injection. Additionally, 120 lbs. of ORC Advanced were applied in cleared boreholes via a backfilling method, which involved drilling to the target depth, retracting the rods and pouring the ORC Advanced slurry down open boreholes to approximately 5 ft. bgs in order to properly abandon points. PlumeStop – An innovative groundwater remediation technology designed to address the challenges of excessive time and end-point uncertainty in groundwater remediation. PlumeStop is composed of very fine particles of activated carbon (1-2μm) suspended in water through the use of unique organic polymer dispersion chemistry. Once in the subsurface, the material behaves as a colloidal biomatrix binding to the aquifer matrix, rapidly removing contaminants from groundwater, and enhancing permanent contaminant biodegradation. ORC Advanced – An engineered, oxygen-release compound designed specifically for enhanced, in situ aerobic bioremediation of petroleum hydrocarbons in groundwater and saturated soils. ORC Advanced produces a controlled release of molecular oxygen accelerating aerobic biodegradation processes up to 100 times f aster than natural degradation rates. During the course of the injection and at the end of the application, increases in groundwater levels, ORP (oxidation reduction potential), and dissolved oxygen were observed in monitoring wells in the treatment area. The successful application of both technologies was achieved within approximately 24 hours, despite the challenging glacial till geology known to the region. With field modifications, RRS was able to not only mitigate surfacing issues by switching to injection via injection-well application, but also achieve the desired distribution of the remediation substrate in the subsurface. The first quarter sampling results indicate that the contaminant concentrations are at non-detect. Following monitoring events over the next three quarters, this site will be closed and issued a No Further Action (NFA) from the Washington Department of Ecology. Antea Group is an international engineering and environmental consulting firm specializing in full-service solutions in the fields of environment, infrastructure, urban planning and water. With more than 3,000 employees in over 100 oﬃces around the world, Antea Group serves clients ranging from global energy companies and manufacturers to national governments and local municipalities.